Study after study confirms the obvious: Companies that invest in big data analytics perform at a higher level and are more profitable than their not-so-data-driven counterparts. So you would think every board of directors would be rushing to instill a top-down data-driven culture, but that hasn't happened yet. Big data analytics is used largely for customer insight (loyalty, churn, etc.) and not for top-level strategy decisions. 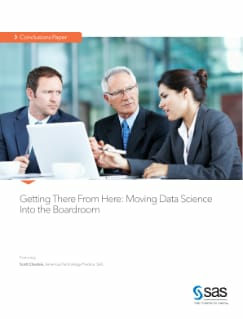 This white paper describes some of the reasons why this happens, and what data scientists can do to help instill a data-driven culture at the top leadership ranks of the company.